In 1982, Britain and Argentina had been in dispute over the sovereignty of the Falkland Islands for 149 years. Although the population of the islands wished to remain British, Argentina claimed sovereignty, by virtue of their geographical proximity and on the basis of inherited claims from the Spanish colonial era. The dispute came to a head when Argentine civilians landed on uninhabited nearby South Georgia (also claimed by Argentina) and raised the Argentine flag. Argentina's ruling military junta, led by defacto President, Leopoldo Galtieri, interpreted the lack of a strong immediate British reaction, together with planned British naval cut-backs, as a loss of interest in, and willingness to, defend the islands. 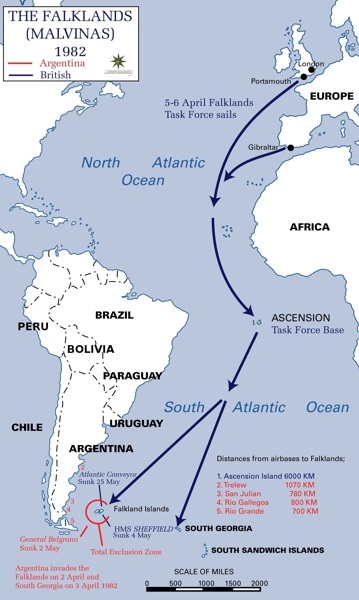 In early April, Argentina invaded the Falkland Islands, overwhelming the tiny British garrison. Outraged and humiliated, Britain quickly assembled a naval task force (consisting of almost the entire Royal Navy), with the objective of recovering the islands. Operation Corporate was the name given to the British military operation to retake the Falkland Islands.